There aren’t many guarantees in life, and even fewer in marketing. But in the world of search engine marketing (SEM), using paid search (PPC) to rank on a search engine results page (SERP) for a given term comes pretty close. That’s why PPC is such good business for Google, which still generates 96% of its revenue through advertising -- because marketers know when they invest in PPC properly, they can get pretty close to guaranteed placement in the SERPs and help you generate leads. The problem is, many marketers suffer from poor PPC campaign management, which ends up costing them way more money than they need to spend and delivering underwhelming lead generation results. So, how do you do PPC "properly" so you actually get leads at a reasonable cost? It comes down to intelligent campaign structure. And how do you master intelligent campaign structure? You use a template. That's why we created a free PPC campaign management template that will help you -- or if you're an agency, the clients you're running campaigns for -- set up a full-funnel campaign structure that follows PPC best practices. Once you do that, you'll be better positioned to maximize the return on your PPC investment. We're going to show you how to use that PPC template in this blog post -- so download the template now so you can follow along with the explanation! Bonus: If you're running PPC campaigns for someone who doesn’t understand the importance of good campaign structure, this template will also act as a deliverable that will enlighten your boss or clients. Alright, got your template handy? Cool ... let's get started! 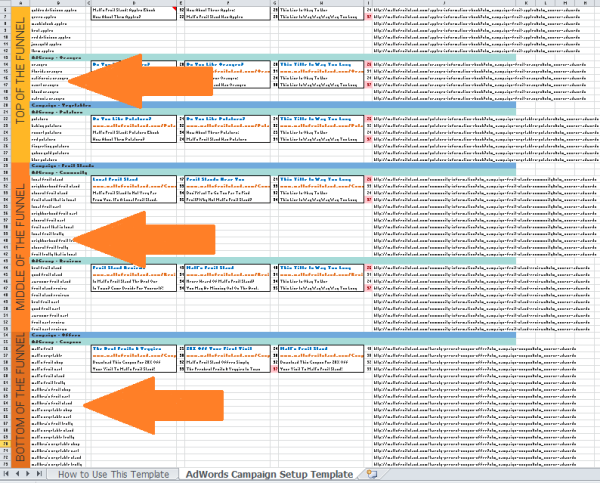 You will want to clear out the example data I have in the template such as keywords, campaign and AdGroup names, ads, and destination URLs. Unless, of course, you're running a fruit stand named after me. Be careful not to erase columns E, G, and I. They contain formulas that will help you in subsequent steps. Any red markers you see in the top corners of the cells contain helpful tips and FAQs -- if you ever forget what a cell is used for, those are good reminders. Before we actually do anything with this template, it's important we're all on the same page about PPC campaign structure. Far too many marketers ("too many" being defined as any number greater than 0) will just set up an account, create an ad, direct the ad to their home page, pick some keywords and hit go. This is not the way to do things. With AdWords, you have the opportunity to create multiple campaigns. Each campaign may contain several AdGroups, and each AdGroup may contain a few ads and multiple, similar keywords. It's wise to create multiple campaigns because you can set daily budget caps, day-parting, and select geo-targeted regions at the campaign level. If you're bidding on generic keywords and branded keywords, you'll want to put these in separate campaigns because the economics around these two types of keywords will likely be very different. As you can see, your template reflects these best practices, providing space for several different campaigns, AdGroups, and ad variations within those AdGroups. The "Destination URL" is the place on your website where you want the PPC traffic to end up. Because there is a marginal cost associated with each PPC visitor you attract, I recommend you choose a landing page URL as your destination URL. Do not drive them to your home page or a blog article in the hopes that they will stumble upon a lead generation form somewhere; that’s the job of organic search. Drive them to what we here at HubSpot define as a landing page, a web page with a form on it -- and don't forget to put in a tracking token so you know where these leads are coming from. I know the big boys don’t always follow this rule, but the big boys also have millions of dollars in budget that needs to have evaporated at the end of the month. Make it easy on yourself and let your landing pages define your AdGroups and campaigns as you see in this template. You will notice that, within an AdGroup, the Destination URL is the same regardless of the keyword or ad. If you really want to drive a keyword to a different landing page, then create another AdGroup -- or in the extreme, another campaign -- for that keyword. You should also keep your sales funnel in mind when you identify these landing pages, and think about which part of the sales funnel each landing page and offer speaks to. For example, an educational PDF about an industry concept would be appropriate for a top-of-the-funnel offer, while a coupon or a demo would be at the bottom of the funnel. You will want to manage each part of the funnel separately, and therefore create separate campaigns. If you scroll down in your template, you'll see that there's dedicated space allotted for campaigns in all of these funnel stages. Next, you will select the keywords that are relevant to the landing page and offer. Make sure to keep them as relevant as possible to increase the chance that each visitor you pay for completes the form on the landing page. Yes, it would be nice to rank for certain keywords, but if the landing page doesn’t answer the keyword queried, think twice. Or better yet, create another offer and landing page that speaks more directly to the keyword. You can use free tools like the Google AdWords Keyword Tool or, if you're a HubSpot customer, our Keywords tool, to understand the actual search volumes and costs around each keyword you select. If you're running short on inspiration, these tools can help you think of other keywords to include in your campaign -- but always consider the costs of those suggested keywords and keep your economic interests in mind. If this is your first time, it would be wise to read up on how to design a killer keyword strategy. And, in the case of AdWords, you could become a quick expert by becoming knowledgeable on the keyword quality score. This is the fun part! Both Google and Bing allow you to create more than one ad for each AdGroup (hence the "group" terminology) and the service will rotate them until it notices that one appears to drive a higher clickthrough rate (CTR). This is how A/B (and C and D) testing works. While it's optional, you should take advantage of the ability to create more than one ad. Writing an ad is a bit like writing a haiku. There are character limits for each part, and it can be a little aggravating figuring out how to best complete the ad. You are allotted 25 characters for the title, 35 characters for the display URL -- the URL that's displayed in the ad, not to be confused with the destination URL -- and 35 characters for each line of copy. But if you're using this template, don’t worry about keeping track! 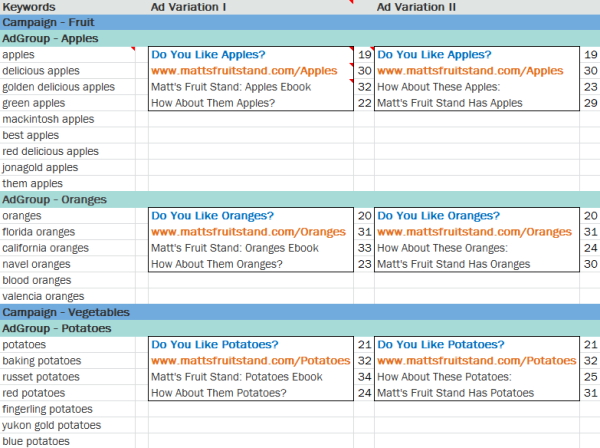 The cell to the right of each ad component will count characters and turn red when you have gone over the limit. Handy, right? In my observation, the title has the greatest influence on an ad’s CTR. It's wise to include a keyword in the headline to draw a user’s attention to your ad. An even better practice would be to use dynamic keyword insertion. I find the copy to be less important, but you certainly can't just put gibberish in there. Search engines have editorial policies for what you can and cannot put in an ad, and they change it frequently, so it's your job to stay up to date on them. A good rule of thumb, however, is to simply try to provide a congruous experience for searchers -- from seeing your ad in the SERPs to completing the form on your landing page. Finally, there's the tricky matter of the display URL. You're only allowed 35 characters here, but it's unlikely that your destination URL, the actual URL for your landing page, will be that short. So the search engines allow you to create a display URL, which may not even be an actual URL on your website. It is critical, however, that the domain in your display URL be the same as the domain in your destination URL. Whether you're doing PPC for your business or a client, your completed template will ensure you're aligning the decision-maker’s expectations with the realities of a productive PPC campaign. If you're the decision maker, this template will help you really think about what you're doing with the money you're spending on PPC. The end result is that you'll have created the sort of congruous user experience that search engines like to see. 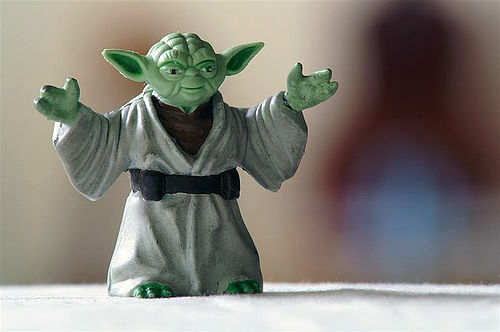 That can benefit you in terms of your positioning in the SERPs and, ultimately, your costs. It will also grant you the agility you need to swiftly reallocate and modify budget as you respond to changes in the marketplace, and the drive to maximize the return on your PPC spend.